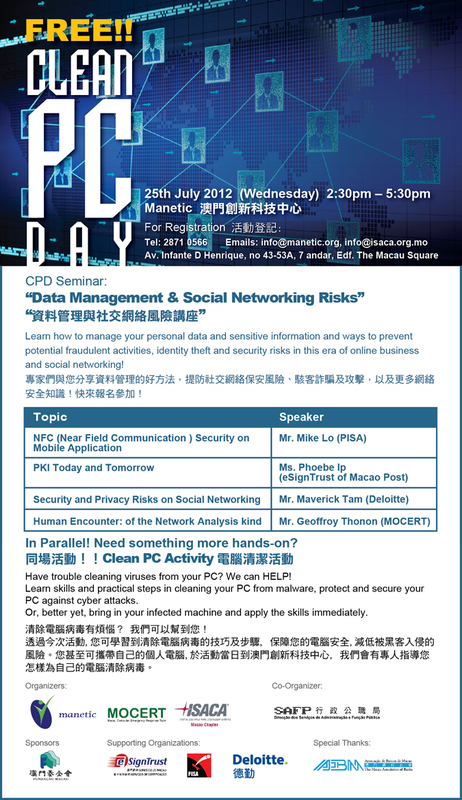 ISACA Macao Chapter jontly hosts with Macau Computer Emergency Response Team Coordination Centre (MOCERT) and Macau New Technologies Incubator Centre (Manetic), and co-organized by SAFP, the event of "Clean PC Day" will be held on 25th July 2012. The event consists of two separate activities running in parallel - The seminar of "Data Management & Social Networking Risks" and "Clean PC activity". The seminar focuses on risks on use of social networking tools and techniques of effective data mangament shared by IT security experts from PISA, Deloitte, eSignTrust of Macao Post and MOCERT. "Clean PC Acitivity" is aimed to reinforce public's awareness of protecting their own PCs by learning skills of practical steps in cleaning viruses from their affected machines. Cost for both seminar and the clean pc activity is totally FREE and three (3) valuable CPE points can be earned by attending the seminar. Act NOW!! * Seats are limited. Registration is required and is on a first-come-first-served basis. ISACA has launched its new web site with major redesign that offers ways to connect global IT community. The new website provides each user a customized and interactive experience with its network of qualified and respected members, and access to the organization’s body of knowledge. Blogs—The ISACA Now blog will include posts from ISACA’s international president, CEO, and other association/industry leaders, as well as a Q&A feature. ISACA members can also create their own blogs on the site. For additional information on ISACA’s web site redesign, please visit www.isaca.org. Seminar - "Vulnerability Scanning Your Own Website"
Due to the recent website defacement event in Macao, the Macau Computer Emergency Response Team (MOCERT) is organising a FREE seminar - "Vulnerability Scanning Your Own Website" to help organisation know how they expose themselves to cyber attackers. This short seminar is aimed both at the person taking care of the website infrastructure as it is aimed for the manager that needs to be aware of the potential issues facing their organisation. MOCERT is sure that attendees of this seminar will be better prepared to respond to computer emergencies. ISACA Macao Chapter has involved in this event as a supporting organization. One(1) valuable CPE point will be granted for attending the seminar. For registration, please download the registration form. ISACA supports its members through a variety of resources and practical tools that are made available only to members. ISACA stands firm in its commitment to members and their enterprises. The new ISACA eLibrary is a comprehensive online collection of content from nearly all ISACA/ITGI published books and over 250 additional titles – all available free-of-charge as a benefit of your ISACA membership investment. Today's dynamic business climate commands you to know and do more, often demanding immediate knowledge and expertise. ISACA eLibrary gives you on-demand access to a goldmine of readily usable information. Check out what is out there for you now at www.isaca.org/elibrary. Invited by the Faculty of Science and Technology (FST), the University of Macau, ISACA Macao Chapter delivered a career message to students from the University of Macau at the occassion of "UM-FST Career Talk 2010" on 18th March 2010. The speech was delivered by Mr. Geoffroy Thonon, president of ISACA Macao Chapter, emphasizing on building up a career path in IT / IS field. 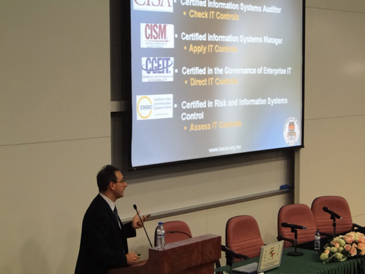 Students, especially from Computer Science major, were shared the introduction of ISACA and its certifications, as well as the importance of certifications of proven skills and experience in bringing them to the next level in career path. 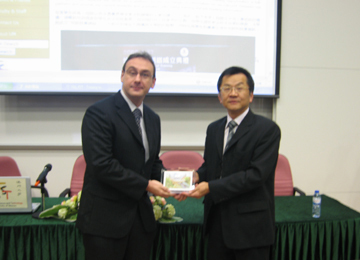 Dr. Philip Chen, Dean of FST, presented the souvenir to Mr. Geoffroy Thonon, President of ISACA Macao Chapter. 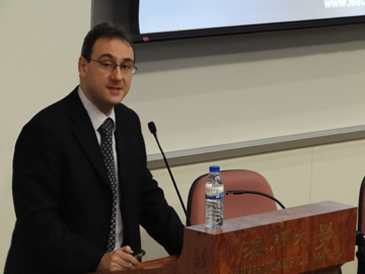 Mr. Geoffroy Thonon, President of ISACA Macao Chapter, gave the speech of "Career Talk for Students in the Faculty of Science and Technology"